Bahia de Los Angeles is a small fishing village located on the shore of a large bay protected by the waters of the Sea of Cortez by the Midriff Islands. 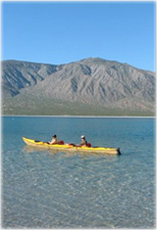 Bahia de Los Angeles is located approximately 400 miles south of the Mexican-U.S. border, reached by traveling south on Baja 1 to a turnoff at Punta Prieta. Whales, porpoises, seals, and the occasional killer-whale frequent the waters nearby and provide fun for those lucky enough to have a boat that can take them into the offshore channels. Fishing guides and boats (pangas) are available in town. The cost is about $80 per day. Equipment is not generally provided, and there is no place in town to obtain it; if you want to go fishing, bring your own gear. The islands also provide a paradise for divers and snorkel’s, although the strong tides and unpredictable winds make both treacherous. The shorelines of the peninsula and the islands contain hidden beaches that are private and appear untouched. rental cars from car hire shannon or from any company that is situated in the area. It is probably most charming because of its primitiveness. August and September can be humid, too. Ice is a precious commodity and quite costly. Fall and spring are pleasant, especially if the north wind doesn't blow. Temperatures are often in the 80's and the water, although too cold for best fishing or swimming, is delightful. Winters are desert-like in that they are warm during the day (70's and 80's), cold at night (40's and 50's). The water gets cold, fishing gets hard, and most visitors are gone. Bahia de Los Angeles is world-famous for its "gravity winds"; in the evenings the wind shifts from the prevailing northerlies to westerly, off of the peninsula. The wind literally howls. When the winds are strongest a visit to Bahia can tax even the most die-hard Bahia fan.